Band Boogie Woogie developed as a highly percussive piano-bassed music in the late '20s, and was characterized by a constant repeating rhythmic figure played by the pianist's left hand freeing the right hand for melody improvisation. Sometimes called "barrelhouse" piano, it helped popularize the "walking bass' form of accompaniment, still heard in the rock piano styles of pioneers like Jerry Lee Lewis. A danceable and joyful kind of music, boogie woogie included among its prime practitioners Jimmy Yancey, Meade Lux Lewis, Albert Ammons and Pete Johnson. The latter three joined forces in the late '30s, as the Boogie Woogie Boys, enjoying a four year residency at the exclusive clubs, the Cafe Society, Uptown and Downtown in New Yourk, into the '40s. 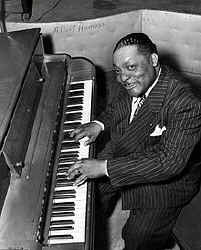 Pete Johnson was often the accompanist of Big Joe Turner, a noted blues shouter. Thanks to jazz critic John Hammond, who promoted these artists, the boogie style enjoyed a brief vogue of popularity from the mid '30s through World War II. Jimmy Yancy refined the technique of using the left hand to create the rhythmic accompaniment that we today recognize as boogie-woogie blues.